Who is ready for what racial justice conversation? The United Methodist Church provides this very useful toolkit, applicable to any group. In my experience, most groups of white people in Princeton are in the introductory category. Those who gather at Not in Our Town’s Continuing Conversations at the Princeton Public Library are in the ‘What’s Next” or “Veteran” categories. Are you passionate about a cause — neighborhood safety, addiction recovery, affordable education, housing and healthcare, racial equality and relations, veteran issues, incarceration and re-entry, gender issues, economic opportunity, parenting, mental health, gun control, the environment …. And do you have first hand experience with it? A new nonprofit, Sidebar Stories, invites anyone to a free workshop this Saturday at PUMC. If you sign up, you will be called an “ordinary expert.” You will learn how to own and tell your story in a way that makes sure it will be felt by those who need to know where you’ve been and what you’ve seen. Founded by a hospice chaplain in Bucks County, Ron King, Sidebar Stories helps people connect real life experience, storytelling and visual art. “We offer a full day workshop for people we call ordinary experts to share a personal story related to a significant social issue that has impacted their life (living on minimum wage, urban violence, disability, race relations, veteran’s issues, affordable housing, etc).” says Ron. At the end of the workshop, you will have made a 3 frame storyboard that can be published or posted to help advocates for your cause determine policies and provide services. Sign up here for the Sidebar Stories pARTy — it’s free, and lunch is included. Optimists about race are more likely to be white, writes Howard Ross, a diversity consultant. Here is a link to my post at the Not in Our Town Princeton blog, quoting Ross, who reviews Ta-Nehisi Coates’ Between the World and Me. This hit home to me. As someone who works against racial bias at Not in Our Town Princeton, I encounter some white people who deny racism exists here. Others insist on recounting their own progress toward wiping out bias and cast an optimistic light on the nation’s progress. “But I can afford that hope,” says Ross. “I am white.” Here is the link to Ross’s complete text. To gain a deeper understanding, here is last year’s Bill Moyers’ interview with Coates. Garden Theatre hosts a free screening of the documentary on Freedom Summer on Sunday, November 23, 1 p.m. There may be some tickets left at Eventbrite, or just show up and hope. 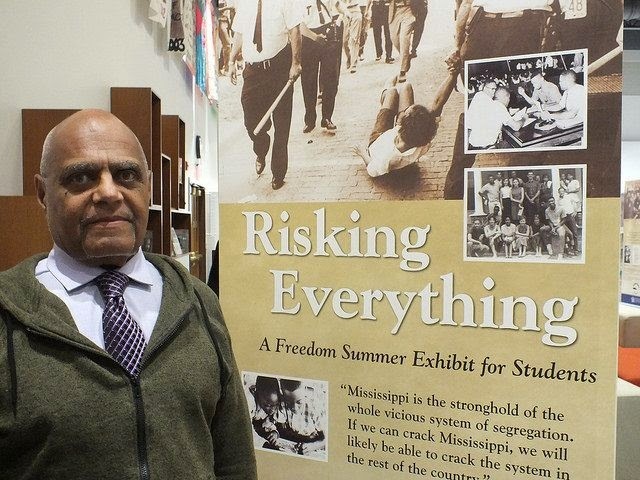 The Freedom Summer exhibit continues at the Carl A. Fields Center from Tuesday, November 25 to Friday, December 5. NIOT hosts its monthly Continuing Conversations on Race at the Princeton Public Library on Monday, December 1, at 7 p.m.
Lawrence Graham, an attorney who writes about race, class, and privilege, speaks at Princeton University on Tuesday, December 2. A screening of the documentary “15 to Life” will be at the library on Wednesday, December 3, co-sponsored by The Campaign to End the New Jim Crow, Princeton & Trenton chapter. Only 7 of the 48 luxury homes in Palmer Square have sold, says the New York Times. It quoted Sheldon Sturges of Princeton Future as saying the development represents an “enormous social justice wound.” Indeed.